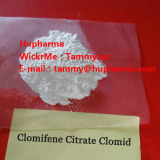 Hupharma Clomid Clomifene Citrate Anti Estrogen Powder Buy Clomid Clomifene Citrate Powder, Raw Clomid Clomifene citrate Powder, Clomifene Citrate Clomid Anti Estrogen Powder, Anti Estrogen Clomid Clomifene Citrate Powder Product name: Clomifene Citrate CAS: 50-41-9 Purity: 99% Molecular formula: C32H36ClNO8 Molecular weight: 598.08 Appearance: white or milky white crystalline powder Description： Clomid is the commonly referenced brand name for the drug clomiphene citrate. It is not an anabolic steroid, but a prescription drug generally prescribed to women as a fertility aid. This is due to the fact that clomiphene citrate shows a pronounced ability to stimulate ovulation. This is accomplished by blocking/minimizing the effects of estrogen in the body. To be more specific Clomid is chemically a synthetic estrogen with both agonist/antagonist properties, and is very similar in structure and action to Nolvadex. In certain target tissues it can block the ability of estrogen to bind with its corresponding receptor. Its clinical use is therefore to oppose the negative feedback of estrogens on the hypothalamic-pituitary-ovarian axis, which enhances the release of LH and FSH. This of course can help to induce ovulation. Usage: Clomid is used mainly in female infertility, in turn mainly as ovulation induction to reverse oligoovulation or anovulation such as in infertility in polycystic ovary syndrome.